Portland drivers have to purchase liability insurance coverage, personal injury protection (PIP) insurance coverage, uninsured motorist coverage, and underinsured motorist coverage. After any accident, PIP should pay medical bills for all drivers no matter who caused the accident. If a collision caused serious injuries, victims can make a claim against the driver who was at fault and the driver’s liability insurance should provide compensation for excess medical bills and financial loss, as well as for non-economic damages like pain and suffering. When a Portland rear-end accident happens, usually the driver in the rear vehicle is presumed to be at fault for hitting the back of the car in front of him. 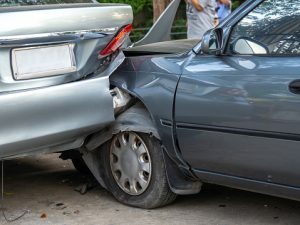 The front driver is thus going to have more options for having larger losses covered, since the front driver can use PIP coverage, file a lawsuit to get compensation through liability coverage, and use uninsured or underinsured coverage if the rear driver didn’t have sufficient insurance to cover losses. Because most motorists involved in a rear-end crash are going to be making some type of insurance claim to get medical bills paid, victims of crashes need to know how to deal with insurers. Insurance companies tend to try to underpay claims or even deny claims where they should provide payouts. Report the collision. The crash should be reported to the police so the police can document how the accident happened. The insurance companies should also be notified right away after the crash happened. Immediately seek medical attention. To get medical bills covered after a rear-end accident, collision victims have to demonstrate their injuries were actually caused by the accident. A medical report from immediately after the crash which documents the injuries can be essential. Ensure all injuries are documented. Let your doctor know you plan to make a car crash claim for compensation. Be sure the treating physicians carefully document the full extent of all injuries caused by the collision. Keep careful records of treatment. You should keep careful records of all treatment you undergo so you can show how bad the injuries were and how costly your care is. Get experts to help estimate ongoing costs. If you settle your claim or if you go to court and make a car accident claim, you may still have injuries that you are being treated for at the time your case is resolved. You’ll want a medical expert to help you estimate what ongoing expenditures you’ll incur so you can try to get compensation for those so the insurer covers your costs. It is also a good idea to consider getting legal hep so an experienced attorney can deal with the insurer on your behalf and help you to fight to get your bills covered.